The Institute for Supply Management Conference in Orlando got off to great start yesterday with a keynote speech from former Secretary of State Colin Powell. But the great news was the release of ISM’s Business Survey Committee’s Economic Forecast for 2017 for US businesses. Based on survey responses from purchasing and supply executives in both manufacturing and non-manufacturing sectors, business looks to be booming across the board through the rest of the year. Sixty-four percent of respondents from the panel of manufacturing supply management executives predict their revenues will be 8.5 percent greater in 2017 versus 2016. This compares to fifty percent of non-manufacturing purchasing and supply executives who expect their 2017 revenues to be greater by 10.6 percent versus 2016. The 17 manufacturing industries reporting expectations of growth in revenue for 2017 — listed in order — are: Electrical Equipment, Appliances & Components; Textile Mills; Computer & Electronic Products; Furniture & Related Products; Apparel, Leather & Allied Products; Primary Metals; Paper Products; Fabricated Metal Products; Miscellaneous Manufacturing; Food, Beverage & Tobacco Products; Petroleum & Coal Products; Plastics & Rubber Products; Machinery; Chemical Products; Wood Products; Nonmetallic Mineral Products; and Printing & Related Support Activities. The 14 non-manufacturing industries expecting increases in revenue in 2017 — listed in order — are: Information; Wholesale Trade; Construction; Retail Trade; Finance & Insurance; Arts, Entertainment & Recreation; Health Care & Social Assistance; Professional, Scientific & Technical Services; Mining; Utilities; Accommodation & Food Services; Agriculture, Forestry, Fishing & Hunting; Educational Services; and Transportation & Warehousing. Survey respondents expect a 5.2 percent increase in capital expenditures in 2017. This is notably higher than the 0.2 percent increase predicted by the panel in the December 2016 forecast for 2017. Specific reasons for the increased spending included the general business outlook and prospects for regulatory reform. To read more about the ISM Report, click here. 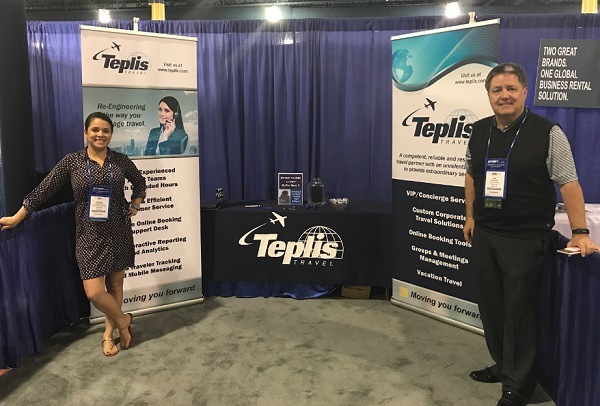 Team Teplis was represented at the conference by Senior Vice President Phil Crofton and Manager of Business Development Melissa Nino (pictured above). They will be making new friends and visiting with current ones all week…time will only tell whether they will get to take that special “behind the scenes” tour of Walt Disney World!